In response to the Shape of Training report (SoTR), the four UK Departments of Health agreed at the UK Scrutiny Board in February 2014 to form a steering group (STSG- Shape of training steering group) to consider how to take forward the report’s recommendations. The UK Shape of Training Steering Group (UKSTSG) reported in March 2017. It offers policy advice and describes a structure and process for the implementation of the key recommendations arising from the SoTR that is practical, proportionate and will cause a minimum of service disruption. UKSTSG has worked with individual Royal Colleges to develop their proposals for curricula change to meet this challenge; namely train doctors with more general skills and train doctors who can work better at the interface between primary and secondary care. As a result of the work above, a new curriculum (link) has been approved by GMC for physician specialties. This new curriculum focusses on the achievement of high level capabilities in practice (CiPs), successfully moving away from the often criticised ‘tick box’ approach for previous curricula. It will produce doctors with the skills needed to manage patients presenting with a wide range of general medical symptoms and conditions which will address the future workforce needs as set out in the Shape of Training report. The curriculum also incorporates the GMC’s generic professional capabilities (GPCs) to emphasise the importance of these professional qualities as well as helping to promote flexibility in postgraduate training. The IM (Internal Medicine) stage 1 programme will comprise the first three years post-foundation training, during which there will be increasing responsibility for the acute medical take and the MRCP(UK) Diploma will be achieved. It will include mandatory training in geriatric medicine, critical care, outpatients and ambulatory care. IM stage 1 training will replace core medical training (CMT) from August 2019. JRCPTB, on behalf of the Federation of Royal Colleges of Physicians, has produced a model for physician training that consists of an indicative seven year (dual) training period leading to a CCT in a specialty and internal medicine. 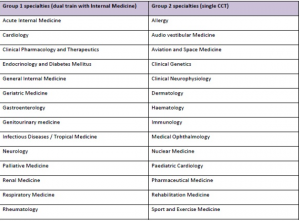 Stage 1 training in internal medicine will comprise the first three years post-foundation training followed by competitive entry into specialty plus internal medicine dual training (see training pathway for group 1 specialties). A minimum of three years will be spent training in the specialty (there will be variation across specialties) and there will be a further one year of internal medicine integrated flexibly within the programme. This will ensure that CCT holders are competent to practice independently at consultant level in both their specialty and internal medicine. This model will enhance the training in internal medicine for all physicians. In particular, it will promote the management of the acutely unwell patient with an increased focus on chronic disease management, comorbidity and complexity in the main specialties supporting acute hospital care. A number of specialties managed by JRCPTB will continue to deliver non-acute, primarily outpatient-based services (see training pathway for group 2 specialties). These specialties will recruit into ST3 posts from IM2. Trainees who have completed the full three year IM stage 1 programme will not be precluded from applying for group 2 specialty training. Alternative core training pathways may be accepted for some physician specialties and will be defined in the relevant curricula. 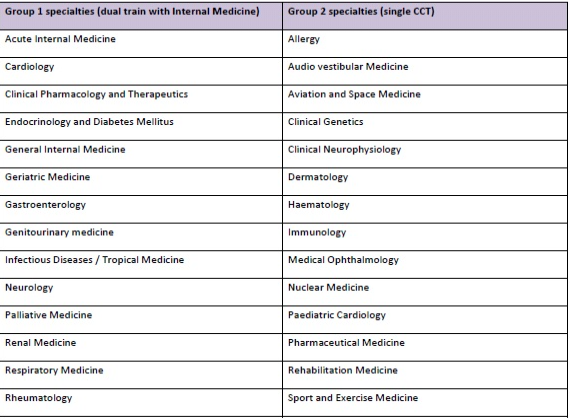 A list of specialties that will dual train with internal medicine (group 1) and those that will not (group 2) is given below. This entry was posted on Wednesday, December 20th, 2017 at 6:47 pm and is filed under Uncategorized. You can follow any responses to this entry through the RSS 2.0 feed. Both comments and pings are currently closed.